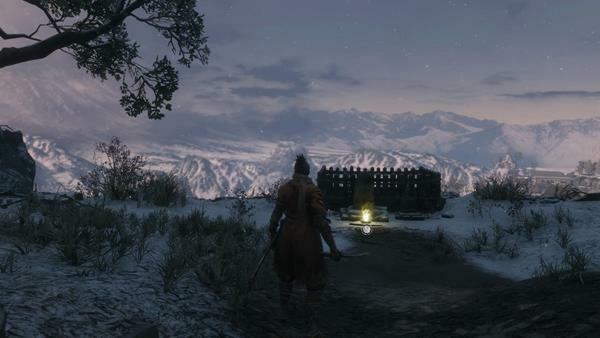 Ashina Castle is a Location in Sekiro: Shadows Die Twice. 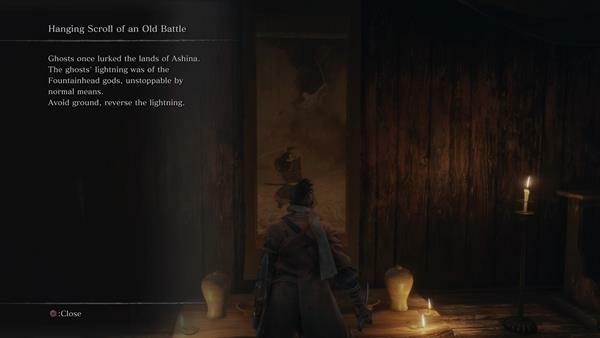 This page provides a full walkthrough with all items, npcs, bosses and secrets found in Ashina Castle, located just after Ashina Outskirts. This is a grandiose location with walled high towers, defended by fearless warriors that will take to the skies and propel themselves onto their targets as if birds of prey. Ashina Castle is an impressive complex guarded by tall walls, fearless Ashina Samurai and the agile Nightjar Ninja. They protect the nobles within the palace, as well as guarding against the scape of the hostage: Kuro The Divine Heir. After grappling onto the roof of the first locked gate, look behind you to see two Senpou Assassin (straw hat stocky fellows). They will discuss the Land of Ashina might not survive long as Lord Isshin is sick and mention a separate mission by the Serpent Valley. Be mindful that these enemies have ranged attacks, a perilous grab, and can also inflict the Poison Status Abnormality. They will also grapple onto ledges and follow you around. To engage them, it's best to go to the left side and stealth the one that is hiding behind a tree. The Loaded Axe is particularly useful against these enemies, wait until they are charging at you, and then use it to open them up to a Deathblow. These enemies can drop Black Gunpowder. Pick up 1x Pellet. If you go back to talk to Tengu of Ashina he'll reward you with Ashina Esoteric Text, which unlocks the Ashina Arts tree. He mentions that they have no specific rules but winning and that it will assist you in further "rat hunting". Now go to the Sculptor's Idol and unlock the first passive skills in Ashina Line if you have the skill points, as they are very useful. Return to the castle gates and go to where you fought the rats. A small staircase down leads to three dogs and a warrior. Defeat them and continue on. Two enemies and 1x Ceramic Shard await ahead. You can take a branch to the left of the ceramic shard to get around the enemies and stealth them if you wish. A third warrior comes out of the gate, deal with him then look the way you came from and slightly left, you'll want to jump and hold onto the yellowish ledge. Go up this path and grapple onto the roof of the building, there's 1x Spirit Emblem behind you and a jump + grapple to a branch to obtain 2x Gachiin's Sugar and 1x Scrap Iron. But BE CAREFUL as Poisonous Lizards hang above the items. Kill them with shurikens to be safe. Each lizard gives you 19XP. Return to the main building before the Spirit Emblem and collect 1x Light Coin Purse. This building affords you a great view of the area below, and you will spot 2x Mallet Soldier. You can jump down and eliminate one right away as you land. Move out of the way to force the adds to separate and come at you one by one, kill them and engage the Mallet Soldier last. Its hammer attacks are slow, but it has an AOE effect that you should be mindful of in the form of a barrage. Jumping away from the attacks seems to work well. Each one of these gives you +38XP. Before you leave this area, climb onto the wall near the entrance tunnel and look down - there's 1x Ako's Sugar that you can pick up. Turn around and Grapple onto the protruding rooftop to go back up. You will then want to go to the furthest side of the empty area and go up a short staircase that leads to a cliff, there's 1x Scrap Iron in this corner, as well as 2x Fistful of Ash. Go toward the exit gate and grapple up, and an Eavesdropping opportunity will trigger. The guards discuss that there's something being used for a battle that does not discriminate between friend or foe. You will want to make sure to equip Shinobi Firecracker before going forward. Continue ahead and you'll be greeted to "Ashina Castle" naming. Three enemies await, but as soon as you make it past half point of the area a mini-boss appears. After the fight, you'll go through a gate and meet an old woman NPC. You cannot do much now but talk to her regardless. 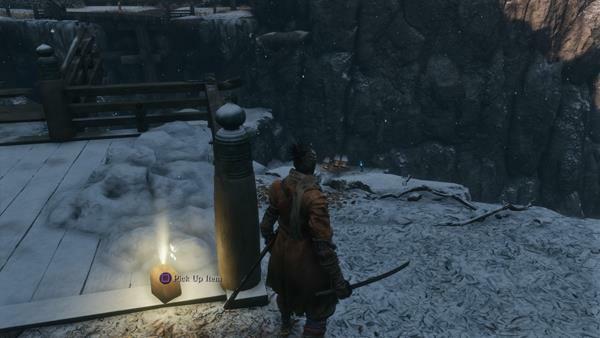 Ahead, commune with the Ashina Castle Sculptor's Idol, and use your Prayer Beads if you have four and have been following our guide, this will give you the Second Prayer Necklace item and thus enhance your attributes. This idol marks an important Divergence point as there are several ways to go: Ahead up Ashina Castle, or to your left toward Ashina Reservoir and the Abandoned Dungeon. Go back to where the praying woman is, and jump and grapple to make it across the moat. If you fall, you'll get 1x Spirit Emblem and can grapple back up from the other side. Once across, go left inside a building to pick up 1x Light Coin Purse. From the gate, take a moment to eavesdrop on the enemies, who will comment on putting armor on someone from "Taro's Troup". They say it is an unwieldy thing that might come off surprisingly easy. Defeat the enemies here to get 1x Gatehouse Key. 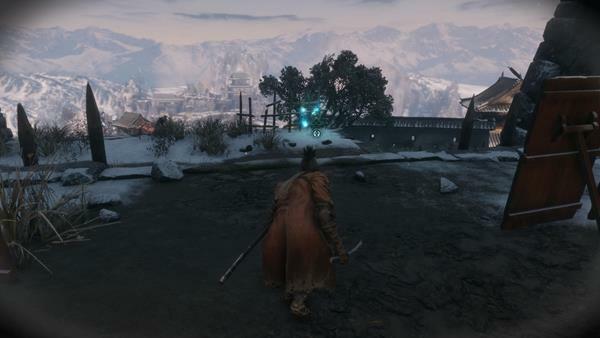 If you pay attention to this area, you will notice that it's the upper echelons of what you originally knew as "Ashina Reservoir" and you're standing on the bridge under which you first learned to wall jump and ledge grab. Going down will take you to Ashina Reservoir Revisited. You will fight a powerful bell-wielding mob and 3 dogs, and obtain Scrap Magnetite and 186XP for defeating him. Pick up 1x Black Gunpowder behind him. 1x Heavy Coin Purse lies ahead, and to the left there's the Abandoned Dungeon Entrance Sculptor's Idol. Battlefield Memorial Mob is here too, with different items. Going this way will take you to the Abandoned Dungeon. Walk a few steps from the Idol and interact with a remnant to see a short memory of Kuro and Emma. Kuro says he will use the "Reed Whistle" from Ashina Reservoir times to call upon you, the Wolf, this time. Go left from the Remnant and jump over a wall too tall onto some water. Grapple out and you'll find 1x Scrap Iron and 1x Mibu Possession Balloon. From here, you can open a nearby door to go into the structure nearby. Go inside and open another door and you'll emerge at the courtyard you were before jumping the wall (near the remnant). You can now drop down and pick up 1x Pellet and unlock the nearby door. 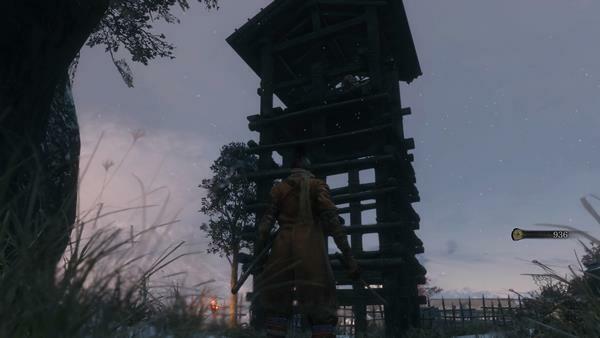 This is the closed gate from the tutorial, right next to Ashina Reservoir Idol. Commune with it and continue to Ashina Reservoir Revisited if you want to unlock a new prosthetic. Return to Ashina Castle Idol and this time go to the right side. The rooftops in this area have special flying mobs. Up the stairs, you can find General Kuranosuke Matsumoto. Grapple onto the rooftops and drop onto some of the Rifle Wielding Guard ads to eliminate them before the battle, or remove one posture bar from the boss. You will need to kill the adds before engaging the main boss or they will get you with the rifles the whole fight. Defeating him will grant 1x Prayer Bead and 280XP, 89 Sen. The chest behind him contains 1x Divine Grass. Around the corner, there's Mibu Balloon of Wealth x1 and a dropdown to NPC. This NPC is Fujioka the Info Broker. 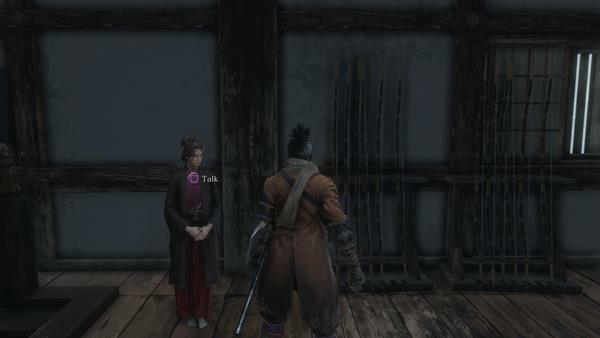 Talk to him and respond yes, and he will ask you to defeat the Samurai of Ashina in exchange for information. Go down and defeat the cluster of enemies in the courtyard, and you can loot 1x Ceramic Shard. The area below is populated by many enemies including the "Rats", rifle-armed warriors, and a new Nighjar Ninja-masked assassin type enemy that attacks with projectiles and at high speed. They yield 76XP. You will find 1x Scrap Iron by a tree overlooking the moat and bridge with the Ashina Castle Idol, and 3x Fistful of Ash on a courtyard right by the tunnel connecting to the Remnant of Kuro and Emma. Once you have cleared the area, return to Fujioka the Info Broker and he will reward you with 1x Nightjar Beacon Memo. He now becomes a Merchant at the Dilapidated Temple. You will notice Incense Smoke going up from some rooftops. Jump onto the first one you see ahead of where the previous items were, and then to the second roof beyond. From here you can access 2x Ceramic Shard. Make your way toward the bigger building with a purple banner, defeat the Nighjar Ninja here and spot the two across the way, that's your destination. Step a big back from this tower and grapple onto its roof, there's 1x Pellet in a nest. Grapple onto the opposite building and take on the two enemies here. If you are having trouble with them, you can attempt to dash past and hide, but there are a lot more ahead so it will require a lot of grappling. You can alternatively use items to boost your performance. The item ahead in one of the rooftops is 1x Ungo's Sugar, and you can stealth around these rooftops to defeat several more enemies. After thinning out the enemies, you'll notice a remaining item, this is 1x Ceramic Shard. From here, you will face some challenging enemies. 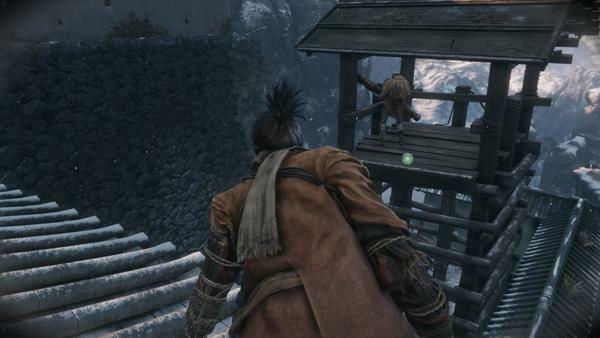 Go up the stairs and to the right so you can go around the dividers and ambush the Ashina Samurai. Open the nearby door and you will see a lot of them patrolling the area, as well as an old woman who will call for help if she spots you. Wait for their patterns to align, then approach inside and kill her first. once she's out of the way, retreat and wait to deal with the samurai, that gives you 78XP and has a chance to drop Pellet. Dropping down the hole in this area allows you to open the main gate of the castle (leading to Ashina Castle Idol), and pick up prosthetic tool Sabimaru, as well as 2x Eel Liver, 1x Gokan's Sugar and the path to the Old Grave Idol. For the purpose of this walkthrough, we'll assume you didn't jump down. If you did, skip to "To Old Grave Idol" heading below. 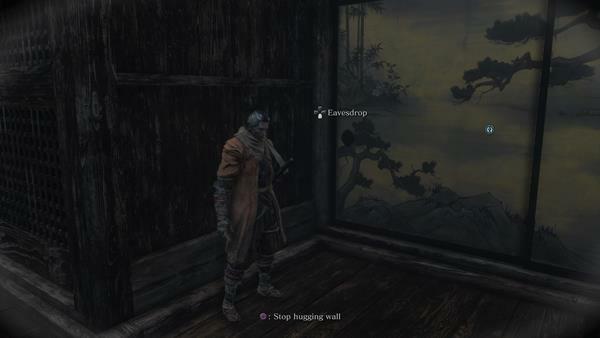 Follow the wall to the right of where you entered and you'll find 1x Pellet and a Ashina Samurai you can stealth-kill. 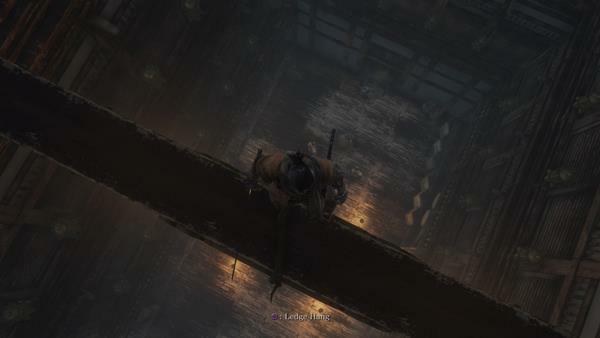 From here, you can see there are 3 Ashina Samurai in the adjacent room. Grapple onto the ceiling and go into the crawlspace to pick up 2x Gachiin's Sugar and get a good view of their positioning. You can use these grapples to get to a safe space if you are in a tight spot. In the room below you, there's 1x Scrap Iron and 1x Ako's Sugar. Right where you got Ako's Sugar, hug the wall and use the hidden passage. You'll get 1x Light Coin Purse, 1x Heavy Coin Purse (behind a breakable screen) and a treasure chest with 1x Prayer Bead. Go to the ceiling crawl space and make it to the other room, there are three enemies here, one woman and two Ashina Samurai. Stealth kill one of them and then open the door, you'll be immune to damage while you do it. Kite the other outside and use your Loaded Spear to deal damage from a safe distance, or dispatch as you prefer. When done, proceed forward and pick up 1x Mibu Balloon of Wealth from the staircase and 1x Gokan's Sugar from the top landing. A remnant is available ahead, where Kuro and Emma talk about Ashina's plans of using Rejuvenating Waters. Those waters spring from the Dragon's Blood and make those who drink it unable to die. There are three feathered enemies ahead that can be quite challenging. aggro them and run back to the crawlspace to lure them out and separate them. They give 84XP. The room ahead contains 2x Eel Liver and 2x Pellet. Go upstairs from this room and you'll find 1x Isshin's Letter. A tower nearby has 1x Gachiin's Sugar. 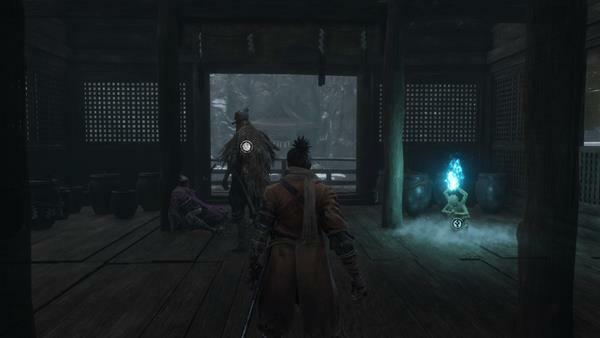 Go back to Ashina Dojo Idol, and open the door to reveal a room. Within it is Ashina Elite - Jinsuke Saze. The trick to defeating this master swordsman is to deflect his attacks, his posture will fill very fast and you will be able to defeat him very fast. Afterward, you're rewarded with 1x Prayer Bead and 314XP. In this room, you can pick up 1x Pellet, 1x Scrap Magnetite from here and 3x Eel Liver. You can also interact with the nearby scroll for some lore. You will now get your rematch with Genichiro Ashina. See his page for details on how to defeat him. Upon beating him, you will be rewarded with 2000XP, Memory: Genichiro and unlock your first Ninjutsu: Bloodsmoke Ninjutsu. Commune with the nearby idol to unlock the Castle Tower Lookout travel destination, then talk to Emma. She will reveal that she works for Isshin Ashina, who has no desire to use the Divine Heir's blood and has thus tasked her with assisting Kuro's escape. Go down and commune with Upper Tower - Kuro's Room idol. This room contains 1x Scrap Magnetite, and if you go behind some dividers you get an Eavesdropping Opportunity where you can hear Emma ask when Genichiro lost his way. You can also find 1x Hidden Wall that leads to the Dilapidated Temple. This is probably how Emma comes and goes. After this, approach your master. He reveals he wishes to sever the stagnation that is caused by the Dragon Heritage. The game gives you a choice: Help Kuro or Obey the Iron Code, Protect Kuro. If you select Help Kuro, Sekiro reponds with "I cannot break the Iron Code" so the only option you have is to Obey the Iron Code. Kuro will ask you to join him in his quest to Sever Immortal ties. You will receive Immortal Severance Text. He asks you to look at the incense burner nearby. Apparently, it belonged to a previous Divine Heir, Lord Takeru. The scent of the fountainhead is the key to reaching the divine realm that Kuro wants to go to in order to obtain Dragon Tear. Lord Isshin Ashina is at the tower where you found Isshin's Letter. When you talk to him, he gives you 1x Unrefined Sake. Talk to him and ask him about the Immortal Severance and he will say you need Fushigiri, the Mortal Blade. Ask him where can the Mortal Blade be found and he will say it's in Senpou Temple, but can't be taken. Show the Sakura Droplet: It's something left behind by Lord Takeru. You can keep the droplet or give it to Kuro. Ask about the flower gets you 1x Fragrant Flower Note. It seems this takes you to the Sunken Valley. This is accessed via the Serpent Valley, that is just beyond Ashina Castle. You have to fall down. Ask about the stone refers to a hidden village. The access is near Moon-View tower in Ashina Reservoir - that would have been the Bottomless Hole idol in Abandoned Dungeon. Go back to Upper Tower - Antechamber Idol and find this room patrolled by 1x old woman and 1x Ashina Samurai. Dropping down the hole in this area allows you to open the main gate of the castle (leading to Ashina Castle Idol), and pick up prosthetic tool Sabimaru, as well as 2x Eel Liver, 1x Gokan's Sugar and the path to the Old Grave Idol. Unlock the nearby door leading to a pond. If you drop into it you'll find some aggressive fish in the lake, which you can kill easily. Then grapple to shore and there's a locked gate. Grapple onto a branch and jump on the ledge, then approach the monk enemies ahead cautiously. You will receive 1x Heavy Coin Purse. Ahead of these two Rifle Wielding Guard, commune with the Old Grave Idol. and you will see 1x Gachiin's Sugar in a nest perched on a wall nearby. The buildings down to your left contain many treasures, but first, you need to deal with a Cannoneer on a building at the end of the staircase. As you approach the bottom, enemies will have a conversation about a miscreant nearby. Grapple onto the rooftop ahead of them and position yourself to grapple to the Cannoneer, and you can stealth deathblow him. Now drop down onto the other two guys, and prepare to kill a third spear user that will come by. As you prepare to go down the stairs, you'll note another cannon enemy and a "Senpou Assassin" in the building with the broken roof. Now drop down again behind the tower with the cannon enemy and land on a Rifle Wielding Guard that you can stealth kill. Defeat one more enemy by the watchtower, then go up and kill the cannon-bearer. Drop down from the hole in the broken rooftop, and talk to the NPC Blackhat Badger. He asks if you're one of the Nightjar Cronies, which you are not, and comments on how horrible his day is. He says he's strung for coin and wants to sell you items. He sells the Iron Fortress Upgrade Material, that makes the Loaded Umbrella Prosthetic Tool. Outside this room, grab some 1x Ungo's Sugar and drop down to defeat the alarm enemy and finally loot all the treasure you saw earlier. The courtyard has 1x Ceramic Shard, 1x Fistful of Ash, 1x Light Coin Purse, 1x Gachiin's Sugar. Walk toward the wall and jump up and you'll see Ashina Outskirts, Underbridge Valley Idol across the broken bridge. Now go to the broken bridge to find 1x Black Gunpowder. This area is now cleared, so head back up to Old Grave Idol. To the left of the idol you will find a grave and 1x Dragon's Blood Droplet can be picked up. Go back to where you killed the spear monk, and eavesdrop on the enemies on the bridge. They talk about how salt is scarce because it's used both for cooking and for ritual purification, and with all the dead there's not enough for all burials. Bring this information back to Anayama the Peddler at your convenience. Go ahead and defeat them, and the nearby rifle user, and then pick up 1x Mibu Possession Balloon. There's also 1x Mibu Possession Balloon under the bridge. The gate beyond leads to a few Monkey enemies, but first jump and grab onto the side of the gate and walk across it and drop down toward the pond to find 2x Scrap Iron. Back to the Monkeys, they are fast but can be taken down with Shuriken. Each Monkey will give you 19XP. You can replenish emblems as there are 2x Spirit Emblem in the area. Go forward and enter the temple ahead to gain 1x Mibu Balloon of Spirit and commune with the Great Serpent Shrine Idol. Tengu of Ashina has now moved here, and he asks if you have mastered any techniques. Jump across the cliff and grapple, then grapple up again to obtain 3x Eel Liver. This takes you to Sunken Valley. You should now go to Senpou Temple, Mt. Kongo, and finish that area before returning here. 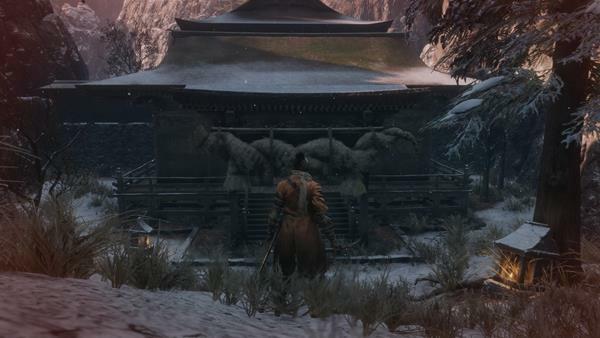 After obtaining all materials from the Sunken Valley Passage and Mibu Village, players will find all Sculptor's Idols at Ashina Castle greyed out. Travel to Abandoned Dungeon Entrance and you'll get an eavesdropping opportunity as you return to the castle. The same Bell Mob & Dogs from previously are outside again, but mostly facing in the other direction, so it is possible to stealth past them on the left & grapple up the gate without them aggroing. 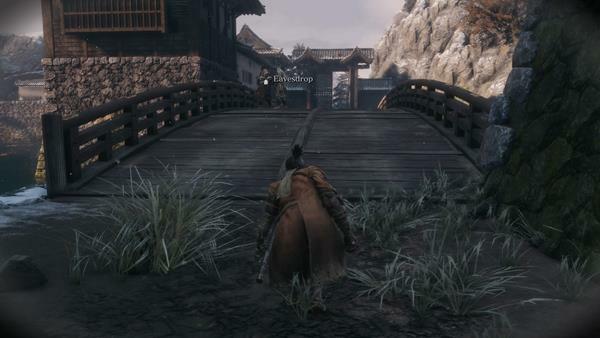 Further ahead, as you cross the bridge a new type of enemy with Dual Wielding Samurai will approach from behind the gate at the other end & attack the regular enemy in the middle, and after disposing of them turn on you. Defeat it and move forward and an NPC will tell you the Nightjar Ninja are attacking. Pick up 2x Pellet. If you would prefer to stealth kill him, you can jump down to the side of the bridge & grapple to work your way through the Rats now delving here, towards the Ashina Reservoir idol. Then enter the building behind it & grapple up to the next level, and exit right to find another Red Hat finishing their regular victim. If you opt to remain unsighted & wait inside the exit until they return to their position, you can stealth behind the arrow screens & then behind them to deathblow. Continue on & light the Ashina Castle idol. The castle gate bridge has been withdrawn, so drop down to the moat and gather 1x Spirit Emblem on the way down. If you grapple up to the bamboo plank & then to the tree at the top of the wall, you will be behind the first Red Hat & can stealth kill them. Back down in the moat, explore underwater to grab 1x Treasure Carp Scale then swim around the underwater passage to the other side of the gate, picking up 1x Yashariku's Sugar and killing 1 Treasure Carp in the way. From here, grapple up and you'll spot a rampart to overcome the wall. You'll fight purple-clad ninjas, that yield 686XP and 70+ Sen. Their attacks can do a lot of damage to make sure to upgrade your posture and vitality with the prayer beads you have gathered. The main staircase has 2x Oil. If you go to the incense-marked area, you'll find dead Nightjar Ninja and 1x Pellet, and new red-hatted poison-spewing "Rats" clinging & waiting to be triggered by your approach to the opposite side of the roof. A courtyard on the ground floor has 3x Black Gunpowder and 2x Oil. The rooftop with the purple banner has 1x Scrap Magnetite. Each of the Red Rats gives 392XP and 52 Sen. If you opened this door, beware that there are 3 dual-wield enemies here. Going up has 1 Purple Swordsman instead. 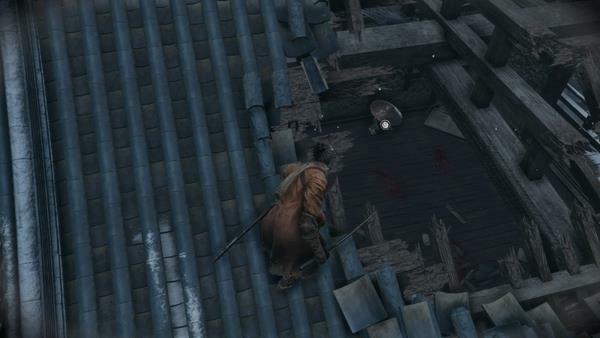 Use the rooftops to your advantage to separate and stealth-kill the Nightjar Ninja. Inside the main door, there is 1x Adamantite Scrap and 5x Oil. Beyond the gate there's a mini-boss but you cannot access it yet, so head up toward the Upper Tower - Antechamber Idol. If you approach Isshin's Room, you can eavesdrop on a conversation between him and Emma. He will say Genichiro has the other Mortal Blade, and he can only use them so many more times. By them, there is 1x Pellet and a Treasure Chest containing 1x Black Scroll. The scroll reveals that the blade's name is "Open Gate" and might open a gate to the underworld. If you get back to Upper Tower - Antechamber Idol, you can defeat 1 Blue-Robed Samurai and Stealth-kill 1 Purple Swordsman. This is a great farming spot as you can get almost 800XP in 30 seconds and reset at the idol. Farm some Skill Points if you need, then move on. The Chained Ogre is Back! It's best to do this fight from above so you get one free blow. Inside the room there's 1x Adamantite Scrap. He gives you 1369XP and 1x Prayer Bead, as well as Shinobi Medicine Rank 3. Open the door for a shortcut back to the Main Entrance & Ashina Castle idol at the bottom of the long stairwell- mind the double-wielding Red Hats waiting in the chamber below to be triggered if you rested at an idol, but if you dash out of sight immediately after opening the door they should not aggro. Then head out the open door on the other side to exit the castle & defeat the same enemies you faced in past visits to reach the Old Grave Idol- there is an eavesdrop opportunity on the Shinobi Hunter on the way. On the path down from the idol to the house that you first met Blackhat Badger, Nightjar Ninja & Red Rats on the walls & gates now join the Cannon & regular enemies guarding the approach- but there are no additional items to be found here. You can now explore the moat leading to the Serpent Shrine Idol. There's a Headless enemy here that you can fight under water- you can find him here after learning the Mibu Breathing Technique, but before collecting all the materials for Kuro. Using the prosthetic, it is possible to kite around him & his tracking ranged attacks & dash in to collect the loot he guards with minimal damage, but you may want to dispatch the man-eating red-eyed carp in the surface of the moat first. Cross the bridge for 1x Mibu Possession Balloon & Yashariku's Sugar at the gate, while the Interior Ministry Ninja & regulars are locked in combat & too distracted to engage you. The monkeys have departed, but Shinobi Dogs now patrol the Serpent Shrine at the end of the path, with Lone Shadow Masanaga mini-boss guarding a Dragon's Blood Droplet on a body nearby. He can be eavesdropped & stealth backstabbed for the first deathblow. If you make it to the top of the castle, a cutscene will play, showing The Owl asking Kuro to come with him, for his own protection. Kuro declines and asks him to leave. THIS IS THE TRIGGER POINT FOR ENDINGS. You will be going to Sunken Valley next. By the Bridge under Old Grave Idol, you'll find Blackhat Badger, who is mortally wounded. Talk to him and he will die, and you can loot 1x Mibu Pilgrimage Balloon. 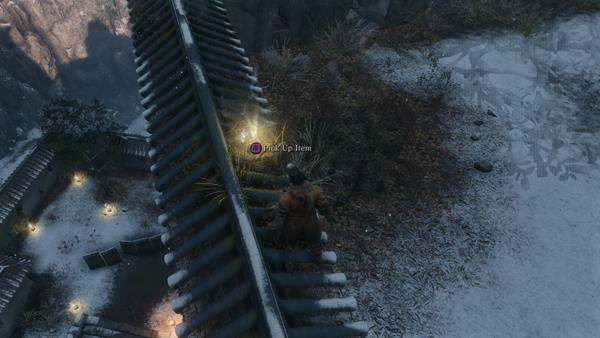 The area by the pond has 1x Fistful of Ash and you can eavesdrop on the monk on the bridge and pick up 1x Ceramic Shard. The gate to Serpent's Shrine has 1x Yashariku's Sugar, and you can find 1x Dragon's Blood Droplet by the Serpent Shrine Idol. Back from Antechamber Idol, drop down to the courtyard to pick 1x Antidote Powder, and then go to the main door of the castle (above the stairway from Ashina Castle Idol) to get 1x Adamantite Scrap. You can also find 1x Ako's Sugar by the area were you cleared up samurai for Fujioka the Info Broker. Back at the main staircase, there is 1x Ministry Dousing Powder and 1x Fulminated Mercury. 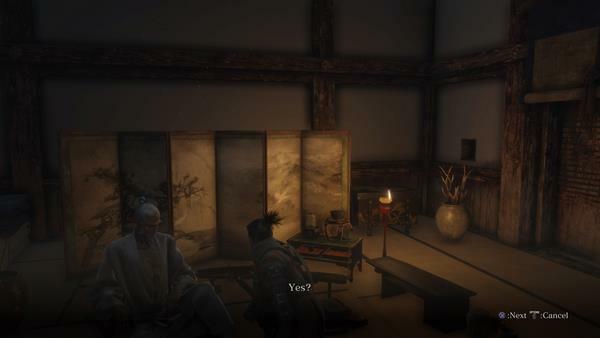 Once you get to Ashina Castle Gate, a dying Samurai will ask you to reinforce Ashina Outskirts and if you reply yes he will tell you about a nearby Kite that you can use to get there. Before proceeding forward, explore the courtyard by the way to Ashina Reservoir and you can get 3x Gokan's Sugar. The Kite will be toward the purple-banner building that you used to initially get on the rooftops, to the right of the staircase. Dangerous red-eyed Nightjar Ninja will attack you so be careful. Grapple onto the Kite and you'll drop near Old Grave Idol and can make your way to Outskirts. You can now go to Ashina Outskirts and then Ashina Reservoir to complete the game. No underwater guide or just in &apos;return&apos; and &apos;endgame&apos; sections? For Jinsuke Saze a cheese technique is to rush him and poison him with Sabimaru and let the poison take down about half of his health. Then run around him and bait him into doing is two strike combo. If he misses you are presented with a perfect opportunity to hit him with Sabimaru again and wait until his his health bar is down so you can do a death blow. It&apos;s a rinse and repeat strategy but works way easier than the video uploaded above. Back Moat - item on body after defeating long swordsman is dragon&apos;s blood droplet. This place is great. It one of From&apos;s most dynamic areas. It basically has 3 different forms at different parts of the game while at the same time acting like a hub that branches out to different areas. It really makes the game feel like it evolves and that time is actually moving as you progress. For the second fight with the Chained Ogre, I found a way to cheese him a lot mostly by pure chance : Starts at Ashina Castle - Antichamber, stealth kill the Samurai and the Purple dude, then drop down. 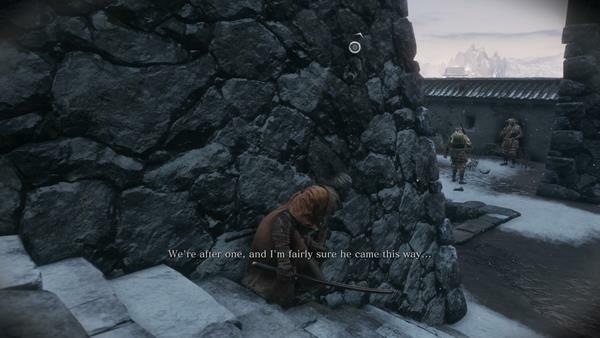 Aggro the Ogre, Open the door leading to the exterior (you&apos;re invincible while doing so) rush out all the way to the Ashina castle idol before the opened bridge. Without using it to reset the fight of course, then rush back to the chained Ogre. He should have lost the aggro so that&apos;s already one kill done. But why rushing out all the way to the idol ? Because you aggro 3 Red Hat shinobi on the way, and THEY ARE HOSTILE TO THE Ogre. So you can just relax and watch the Ogre smash all three while losing a majority of his HP this way. You just have to finish the job with the Flamethrower prosthetic. GG EZ. Missing the Lone Shadow Vilehand Mini-Boss Fight. So what&apos;s the next step after defeating owl? Having trouble with Ashina Elite - Junsuze Saze mini boss. Even if I hold block for his 2 attacks, it takes most of my life. My Vitality is 12 while attack is 3. If I try to dash beside him, he hits me with the 2 attacks anyway. Wtf. The video makes it look so easy. Kuro does not need an item the first time when he ask the Wolf to help him. You are forced to choose "Protect Kuro", after which Kuro convinces you to help him anyways. This will set you on the path to the rest of the game, you later make the "real" choice. Don&apos;t worry about telling Kuro &apos;no&apos; the first time. If you&apos;re having trouble with the very fast nightjar enemies on the rooftops (I know I did): just like the smaller nightjar, the loaded axe (preferably used with chasing blade) destroys them in one hit plus a deathblow.